PROVIDING THE BEST EXPERIENCE FOR YOU AND YOUR FAMILY. At Creighton Pediatric Therapy, we are dedicated to providing the best possible experience for you and your family. Our goal is to help your child reach his or her maximum potential while providing the best care. 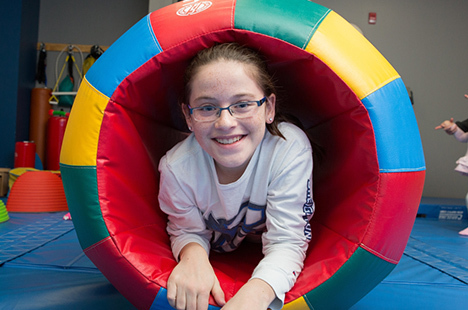 No matter the reason for your child’s visit, we make the experience fun so many children don’t even realize they are working hard.During your appointment, an experienced faculty therapist from the occupational therapy and physical therapy departments at Creighton University will conduct a thorough examination. The initial evaluation will take approximately one and a half to two hours. To schedule an appointment for occupational, physical and speech therapy, call 402.280.2200. We do require a prescription from your child’s physician to begin treatment. Prior to your child’s first scheduled appointment, you will need to complete the registration paperwork. You may also arrive 15-20 minutes prior to your appointment to complete the registration packet in our office. Monday – Thursday: 8 a.m. to 6 p.m.